Hello from your friends at Claremont Canopy! We have been growing at exponential speed! Our canopy now extends even further throughout Southern California. We now are helping over 30 new arrival families resettle in the Inland Empire! That is over 100 people! BIG Canopy news, we heard back from the IRS (after some delay with the government shut down) and Claremont Canopy is officially a non-profit 501c3 corporation! We are thrilled to have this very big milestone checked off the list! The support we continue to receive from our community is AMAZING! In March, the Claremont United Church of Christ dedicated a weekend of their March Mission Madness program to support Claremont Canopy. The congregation generously donated supplies for the Yalla Baskets that we will deliver to our families at the beginning of Ramadan! 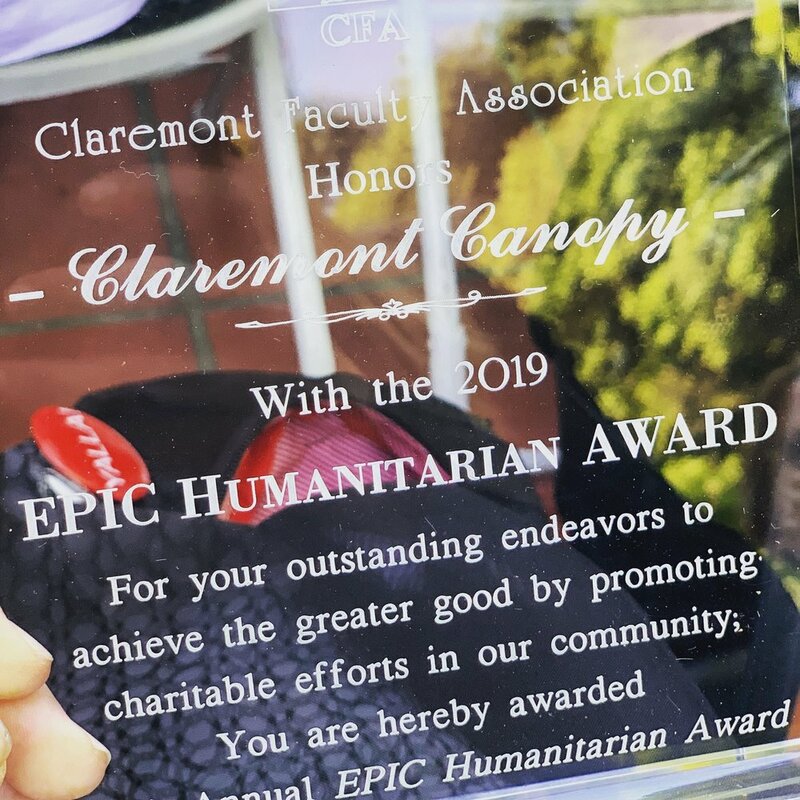 And just last week the Claremont Faculty Association awarded Canopy with the “EPIC Humanitarian Award” for our impact on the Canopy kiddos that attend our local schools.We are so lucky to live in a community that supports our mission. We have had some tremendous family wins as of late! One of our families, after we helped them find steady employment, was able to save enough money to travel and be reunited with their adult daughter, who they had not seen in 7 years since they all fled Syria. On this trip, they were also able to meet the grandchildren they had never met in person. The pictures and video of the reunion had us all in tears. We are so happy to have played a part in this well-deserved reunion! We also had our first Claremont Canopy wedding, the eldest daughter of one of our families got married last month. The reception was beautiful and the bride was absolutely stunning. It was a wonderful time and a real treat for us at Canopy to take part in traditional Syrian wedding festivities. A big part of our mission is to network on behalf of our families and in January we saw firsthand how using our network can have a profound impact. One our families has an adult son that needed some assistance finding the right resources, he wants to get into the work force and also wants to find an educational setting that will fit his needs. We were able to use our network to get him a meeting with the local Department of Rehabilitation office and he was accepted into their program! He will be well on his way to his dream, finding a job and giving back to his new country. His family was absolutely thrilled and we all feel grateful to have found each other. Our Canopy kiddos continue to thrive, two of our little ones were just recognized at their elementary school. One was named student of the month for her class and her sister was named most improved student for the month. Another one of our middle schoolers, who has become very active in after school activities and successful in her studies, was just recognized as student of the month for her 7th grade class. We could not be more proud. The last 6 months have been a whirlwind of growth and opportunity. We continue to solidify our mission and try to reach as many new arrival families as possible. We simply could not do this without your support. On behalf of everyone at Claremont Canopy, we extend our deepest gratitude for standing with us as we help our new arrival families thrive in the United States. We’re in back-to-school mode at Claremont Canopy. All six of us have kids in the local schools, as do most of our families. We’ve been making sure everyone is geared up and ready this Fall. We’re thrilled to be working with Claremont McKenna College’s Center for Writing and Public Discourse (CWPD) on an initiative to help Middle Eastern refugees with language skills and more. Student volunteers will assist families learning English. They will also tutor kids with school work and instruct adults on completing job applications and resumés. We are also partnering with a Claremont High School student who plans on developing a tutoring program for Canopy children as his Eagle Scout project. He is planning on collecting a group of volunteers who will visit our families homes and also help with homework and practicing English. We are so grateful for the Claremont community and their support of our mission. We’re lucky to have two fantastic interns join the Canopy team. Lea Kayali is a senior at Pomona College studying Public Policy Analysis and Anthropology. She’s interested in the intersection between American civil rights advocacy and Middle Eastern communities, an issue close to her heart as a Palestinian American. She interned with various community organizations and policy think tanks before landing at Canopy. She already has brought fantastic insights and organizational skills to all our projects. Eli Tanenbaum studied Arabic and Middle Eastern Studies at Pomona College before graduating this spring. He learned colloquial Arabic during a junior year abroad in Jordan, living with an older couple whose extended family lived nearby. He has been extremely generous helping Canopy and our families with language translation. Eli is currently enrolled in the Scripps Post-Baccalaureate Pre-Medical Program and plans to attend medical school. We’re looking forward to a school year filled with projects and events to help all of our families become better settled in their new communities! The last month at Canopy has been full of celebration and joy, and, unfortuantely, moments of hardship as well. Our community pulled together when baby Masa, the child of one our families was injured in an accident that left her with shards of glass in one of her eyes. The family rushed to the Children’s Hospital LA, and doctors quickly focused on giving Masa the best care possible. Yet in a miserable twist of fate, on the day Masa was released from CHLA, her worn out dad, Rami, collapsed from abdominal pain. He had to be operated on in an emergency appendectomy. The road of recovery for the family will be long and arduous, but they send their deep appreciation for the love and generosity all you Canopy supporters have shown! In a more lighthearted evening on August 4th, Claremont’s monthly Art Walk featured work from a Syrian artist who is donating part of the proceeds of his paintings to Claremont Canopy. New York-based Hadi Toron’s paintings will be exhibited and available for purchase until the end of September at the Claremont Chamber Office. In July, were happy to return to the Islamic Center of Southern California in LA for a meeting with the Muslim Public Affairs Council and the One America Movement. Both organizations encourage Americans from all backgrounds to come together to unite in their efforts for community integration in their communities. This is at the core of Claremont Canopy’s mission, so we are excited to collaborate with such fantastic organizations! We want to say Mabrook (congratulations) to one of our Canopy families, in which all five family members received their green cards this week. For most of our families their journey to America has been long, and the outcome, often unknown. After many years of waiting with fear and hope, seeing their name printed on a card that says “United States of America PERMANENT RESIDENT” is a big step in feeling like this country is their new home. Lastly, here at Claremont Canopy we want to wish all of our Muslim friends a happy Eid al-Adha! The holiday fell on the third week of August this year, as Muslim holidays rotate on a lunar calendar. It is one of the two most holy days in Islam honoring the willingness of Ibrahim to sacrifice his son as an act of obedience to God. Our Muslim neighbors celebrate by gathering together and exchanging gifts. Eid Mubarak! Our Canopy families enjoyed the 4th of July tradition. Many of them attended fireworks around Southern California! Take a look at Canopy's youngest family member pictured above, looking so festive and adorable in her red, white and blue. I simply can't get enough of this little cutie! Earlier in July the Kanjo family, Taghrid, and I were back in Los Angeles! The fantastic folks at Kitchen Table App opened their home to us and the Kanjos shared their culinary secrets as they prepared an authentic Syrian meal for a group of 15! Our very own Taghrid translated for the guests, as Maysaa and Abdul explained each recipe. I am so proud of everyone! After the meal, Maysaa and Abdul shared their journey. They shared details of the trials, tribulations and moments of hope that came with their 6 year long journey from Syria to America. It was a very moving experience and left us all motivated to keep doing more and helping our new arrival families in any way we can. A big thank you and shout out to our partners at New Arrival Supper Club and Miry's List for making this happen! We launched a gift card wish list on Amazon, if you are looking for another way to directly help our families. With the recent judicial judgments in our country, it is more important than ever that communities support and rally behind our new neighbors. We have included cards for the essentials, like food and finances, but we also included fun things like Starbucks cards for our teenagers, who have study sessions over coffee after school. I threw in some movie cards as well, as our new friends learn more english they are enjoying taking in movie now and then. Small gestures like this show our Muslim neighbors we are happy they are here. So if you are able, head over to our Amazon gift card list and help us brighten our Canopy families day! All cards will be delivered to Canopy headquarters and distributed to the families! It has been a busy month at Canopy! And we have a big announcement, I am so excited about this! Canopy will be partnering with the amazing non-profit, "A Country Called Syria" and the Petterson Museum at Pilgrim Place. When the Syrian Revolution started, Maria Khani (co-founder of A Country Called Syria) knew that she had to do something for her homeland, but what? What could be done that would strengthen the world’s connection to Syria in a non-political, non-religious way? The answer was none other than share the beauty of Syria and its people with the world. Stay tuned, this exhibit is coming to Claremont this fall! Yalla! On Friday, we threw a Canopy family Iftar dinner for our Muslim friends to break their fast. It was a wonderful evening of eating and laughing and just relaxing with friends. We would have loved to have opened this to the whole community but couldn't this year for logistical reasons. We hope to make this an annual Ramadan event. Some 18 of our families attended the Canopy Iftar, with over 60 people in all. It was a lively group; children ran around Jennifer's beautiful garden; babies were passed around for adoring; and, as always, there was lots of laughing. Our guests arrived before sundown to sit in Jennifer's lovely backyard and visit. For some of us at Canopy who'd been dashing around to set up the dinner, abstaining from a glass of water or juice while we waited in solidarity was hard! But our guests, who had been fasting all day, were relaxed and happy to sit and talk. The sun went down at 8:01 pm. We shared a beautiful moment at dusk as one of our friends stood up and sang the call to prayer in a rich, deep voice. Then it was time to eat. Thankfully, there was plenty of food. The Meat Cellar generously donated delicious Halal beef kebabs. We bought a large order of Walter's wonderful Narenj Pilaf. And all seven of us Canopy ladies made side dishes and desserts. (But not Christy, we don't let her cook, for everyone's sake.) A big shout out to Brian Kraatz, the home cook extraordinaire, who delivered a fantastic rice dish that was devoured immediately. It's gatherings like this that make all of us at Claremont Canopy feel so lucky. The community of people in our area who've been displaced by forced migration is remarkable. They've all endured more than we can imagine and yet they still bring laughter and friendship wherever they go. We started Canopy to help them but continuously find ourselves benefiting too. The way they make sure to slow down and enjoy family and friends is a reminder to us to do the same. Our hearts always feel so full of joy after we've spent time together. One of our Claremont Canopy friends became a U.S. citizen in January of 2017. On Tuesday, he went to Taylor Hall to vote for the first time. He'd never had the opportunity to cast a ballot, even when he lived in Iraq and then Iran. He told this to the volunteers at the voting center, and they were all thrilled to help him. It was a great first experience. He sent us a message afterwards saying, I did it. I voted. I am officially a US citizen! We are very happy for him. All you eager volunteers, we are revamping our website. Soon it will be easier to let us know what interests and skills you have to give. We'd love to find a way for you to get involved! We’re in the middle of the holy month of Ramadan, which means our Muslim friends are fasting from sunup until sundown every day. They’ve been telling us how much they look forward to this time every year but also how hard it can be. So, we decided to get the community together to show our resettled friends that we’re thinking about them. 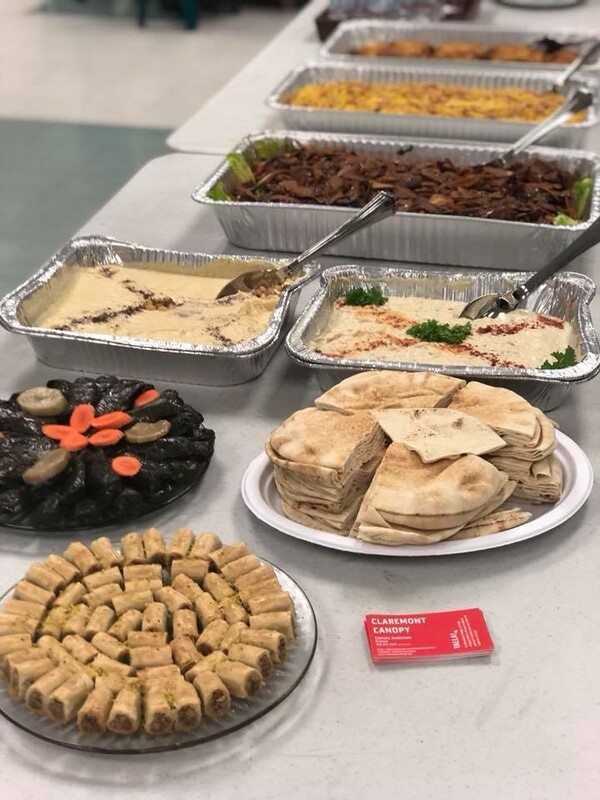 On Tuesday, May 15, we hosted our first annual “Iftar In A Jar.” During Ramadan, families break their fast together every evening with a meal called Iftar. Traditionally, the fast is first broken with dates, followed by other delicious treats and dishes. Many of you in our community generously donated dates and other wonderful things so we had plenty to make a jar for every single resettled person that we work with. Thank you! Also, many thanks to Dania AlKhahouli of the non-profit A Country Called Syria for her great explanation of Ramadan and how it feels to celebrate it. Dania did a fantastic job describing the meaning of Ramadan and why, even given the daily sacrifices of no food and water, it's something she looks forward to every year. To make the jars we all gathered around tables where donations had been laid out. Every person grabbed a paper that had a person’s name and a list of items to put in his or her gift jar. Included was tea, energy drinks, protein bars, plus books for the kids. Each jar also had a traditional Ramadan gift of clothing — gorgeous scarves for the women and socks or shirts for the men. A big thanks to everyone who participated — and to the LDS Church in Claremont for letting us use their space! We have some great news. Last week, one of our Syrian friends was hired by Pilgrim Place as a full-time painter. He’d been working night shifts at a bakery where hot temperatures and hard working conditions took their toll. Before he arrived in the U.S., he'd been a residential and commercial painter for a living and he hoped he could find similar work here. He was thrilled to be hired by Pilgrim Place. We heard that he came home from his first day of work Monday, happier than he'd been a long time (there may even have been some singing). Pilgrim Place is such a warm and embracing place. He was touched that he boss and the people he works with were so kind. And finally, after 14 months, he gets to stay home nights and enjoy dinner with his family. We are in the process of growing and changing. Our team has added two new members. 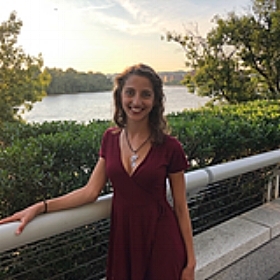 Anita Shenoi, a Claremont McKenna College student, will be joining us for a summer internship, thanks to a grant from her college’s Mgrublian Center for Human Rights. She’s the community liaison for the 5C Refugee Advocacy Network (RAN), working to create opportunities for the college community to connect with Syrian families settled here. She’s also been an English tutor for the families. 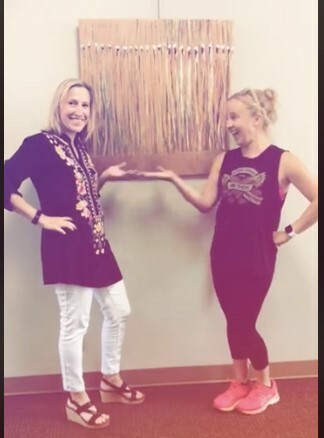 We’re super excited to have her help coordinate events, oversee the booming demand for Supper Club and help advance our Web site and social media outreach. Dr. Anne Bennett has also joined the Canopy family as head of the Job Committee. Many of us worked with her last year when some of our families arrived, helping to find them housing and furniture. She’s an anthropologist who’s taught at the University of Arizona, California State University and Citrus College. She also spent four years as the Assistant Director of the University of Arizona's Center for Middle East Studies. Her ethnographic fieldwork in Syria, conducted in the mid-1990s, focused on the Druze sect. Lucky for us, she’s proficient in Arabic! Our Director Receives An Award! What an exciting week! Our director, Christy Anderson, was honored as the Woman of Distinction for Claremont by our state’s 41st District for her dedicated service helping refugees in our community. The honor was well deserved — Christy has been tireless in her efforts to help local refugee families. It was also a vote of confidence for Claremont Canopy and its mission to help refugees thrive in their new country. Also this week, Canopy has received fiscal sponsorship from Claremont Community Foundation. Which means we will soon officially be a nonprofit! Through the support of California Community Foundation, the organization will house Claremont Canopy donations. So now all donations, financial and material, given to Canopy are tax deductible! A big congrats to our friend, and lead translator, Abdul Kublan for being chosen for a medical residency at Pomona Valley Hospital in Pomona, California! PVH is just a few miles from Claremont! After receiving a medical degree in Damascus, Abdul has been working hard to get his license here in the states. We are thrilled he will stay local. We didn’t want to lose him for three years to another part of the country! 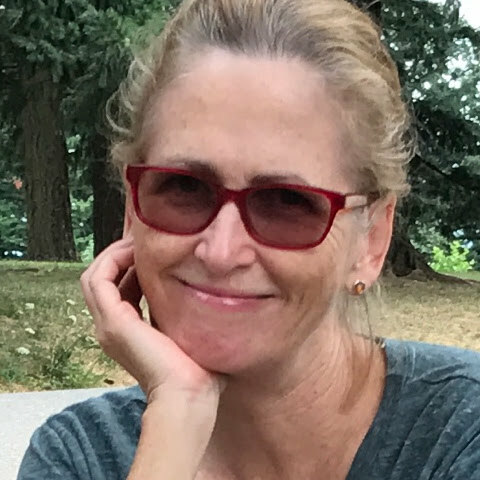 Canopy is happy to welcome Jessica Moss as a new board member. A resident of Diamond Bar, Jessica has worked closely with The Interfaith Council of Garden Grove, Stanton and Westminster to help organizations that assist refugees. She’s worked with ACCESS, A Country Called Syria, and United Nations Association-USA, among others. She has a master’s degree in Sociology from California State University Fullerton and is a regular lecturer at Mt San Antonio College and CSU Fullerton. She’s looking forward to bringing her experience in Orange County to the Claremont area. In the coming week, we’re going to work on exploring how to offer more emotional support for our families and how to provide after-school tutoring to refugee kids. Please contact us if you’d like to get involved. Claremont Canopy Screens "Human Flow"
On Saturday, March 10, Claremont Canopy held our first event and fundraiser at the Rose Hills Theater at Pomona College. Many members of the local community came out on a rainy night to enjoy Syrian food and a special screening of the Ai WeiWei documentary "Human Flow." It was a festive night, kicked off with the singing of "Happy Birthday" to our dear friend Abdul Kanjo and introducing him to an American staple- Costco birthday cake! There was a great energy as people mingled and enjoyed drinks provided by Last Name Brewery and Syrian appetizers catered by the Kanjo family. Many of our resettled friends were there and it was fun watching everyone getting to know each other. With stuffed bellies, we all went into the theater to hear brief remarks by Canopy director, Christy Anderson. Christy spoke about our group and our hopes for this community. Then, to the delight of our new neighbors, she gave a special message in Arabic, which our friends assured us was (mostly) understandable. "Human Flow" is a beautifully filmed look at refugee movements around the world. The film took us into refugee camps, along the escape routes that snaked through multiple countries, and into the minds of those fleeing oppression and violence. It was sobering and moving, but also very humanizing. I think we were all able to conceptualize this overwhelming crisis in a very individual way. This fun and educational evening was a huge success and raised a significant amount of money for Canopy's initiatives. We are now hard at work looking at how we might address areas of need as well as planning for long term support and resources for our local families. Thank you to all who joined us on Saturday! It's an exciting moment for us. For months we've been scheming and planning, building relationships and creating structure. We're taking what we've learned as founding members of a local refugee resettlement team, looked at what works and what doesn't, assessed what the long-term needs of families are, and built an organization that puts the needs of resettled families first. Claremont Canopy will be addressing core elements of long-term refugee success: Employment, Education, Health Care, and Empowerment. We will be partnering with leaders in community, local government, and business to ensure that we can offer the very best relationships and resources. We will be maintaining a Community Advisory Board for this purpose. We will also work with our partners at Miry's List and the New Arrivals Supper Club to utilize the power of social media and crowdsourcing so that anyone who wants to help with refugee resettlement can easily do so. Are you excited? We are. Check out our Facebook and Instagram pages, get on our mailing list, donate to support our mission. E-mail us if you're interested in volunteering, advising, or have any special expertise to lend. Claremont Canopy is a community driven organization and we welcome your help! There is a lot of work to be done, let's get started!